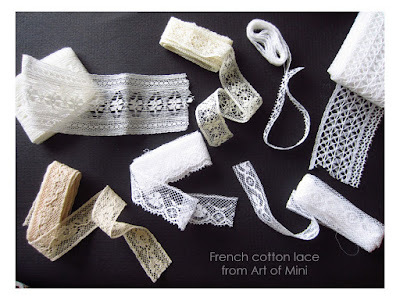 I'm not a very lace-y person, although I like it sometimes, but in miniature: I just LOVE it! And what's an antique store without at least some lace, right? 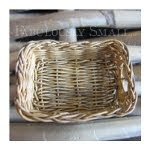 However, lace that can be used for miniature is hard to find. And for as far as I know there aren't any miniaturists that sell handmade lacework. Even if there would be, it would be quite expensive, since lacemaking is meticulous and takes a LOT of time! There's also just so much that can be replicated realistically. I do have some lovely lasered paper lace from 2012 (see 2 photo's on bottom of this post) I'm very happy with, but thanks to Catherine (thanks!) 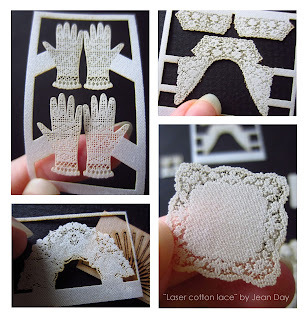 I became aware of some awesome miniature lasered cotton lace by Jean Day. Those got me really excited! 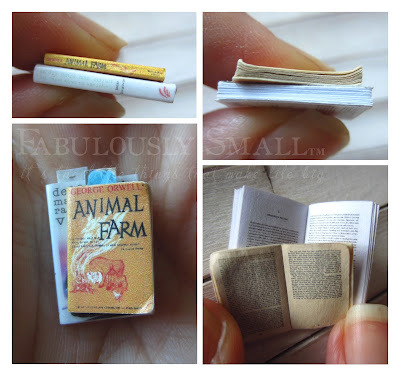 don't you love what modern times bring us miniaturists? Like decals, 3D-printing, lasered anything; I'm a big fan of modern day inventions. I'm sure they would have loved this mini-lace in the 17th and 18th century for their dollhouses! Luckily - for many more reasons than this, haha - I live in the 21st. also my birthday was coming up not too long ago and so I knew what I was gonna ask! (and was lucky enough to get too! :D ). But some - like the 2 tablecloths, the antique colar & cuffs - I will use in a different way than they're meant for, I'm curious to if and how that will turn out! The gloves I chose will resemble knitted ones. I guess they'll be the shop-owners' or something :D.
this brought me in the lace-mood, so I also used some birthdaymoney to order some beautiful French cotton lace from Art of Mini. That they explain on their website is being woven on an original French lace-weaving machine from 1870 (!!). For as long as that machine will be able to work, because they say that when it stops working it can't be repaired... :(. It doesn't make the lace itself antique of course, but it does make it special I think. besides the one in the right corner (photo above) (that's quite stiff and thicker and most likely didn't come from that 19th century lace-weaving machine) their lace is thin and supple. I think they're beautiful and I was pleasantly surprised by them! 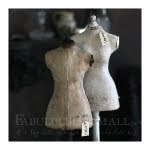 Especially the one on the right below is unbelievably thin and soft! 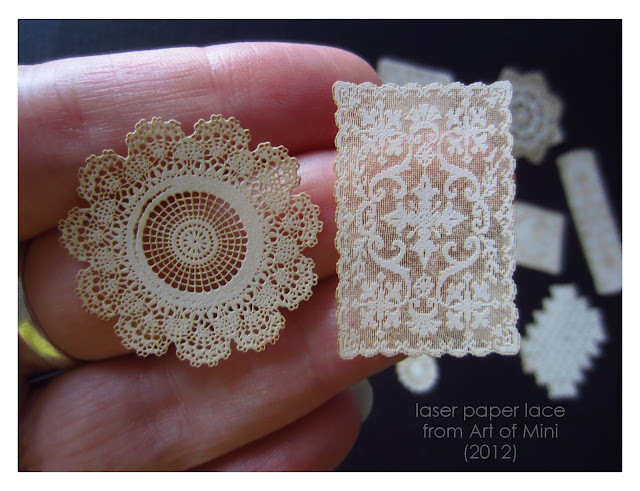 and to complete this lace-post, let's show you what I ordered in 2012 when Art of Mini temporarily sold laser paper lace, as I mentioned in the beginning. Unfortunately not anymore, so I'm extra happy with the ones I got back then! → update: thanks to Kat (thanks!) here's a link for where paper lace doilies and lace is still sold online. I haven't seen all pages (they have a lot of this! ), but I've seen several already that I have too, so you can still have these and a bunch of other types! For 1:12, 1:24 and 1:48 scale. Here's the link (it's page 2 of the doilies-section. Because it starts with lace curtains which I find confusing, so you can go back one page and scroll down to see the ones there too), it's almost 8 pages of laser paper bliss I think :D.
I think the detail on the right one is amazing! 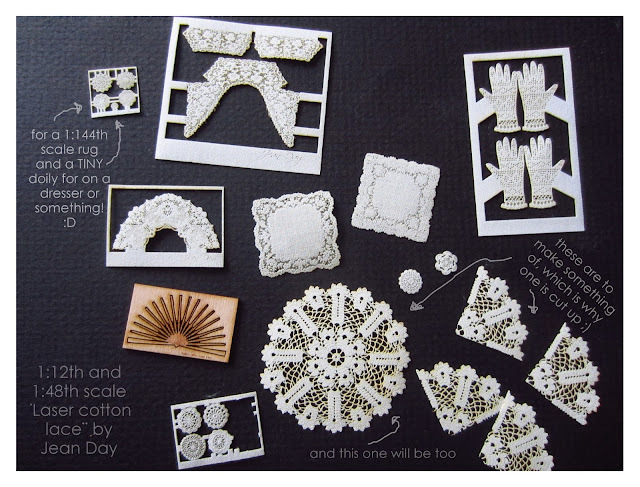 *of course there are miniaturists that make miniature lace and have done some great and amazing stuff! Deborah for example, because she can do just about anything :D ! And yes, that's miniature! And something else she did, a small tablecloth that's just slightly over an inch big - or should I say small? ;) Also Annelies has done some great work. Just 2 examples of lacemaking miniaturists I know is out there, which will be much more! Happy Birthday! Congratulations on all your beautiful laces. Aren't Jean's pieces wonderful. The lace of the Art of Mini is fantastic! I can't wait to see how you will use it all. Thanks Kat :) ! The gloves are great, I agree! Oh thank you so much for your link, I did remember having seen a webstore with them years ago, but could not remember which one it was, so thank you! 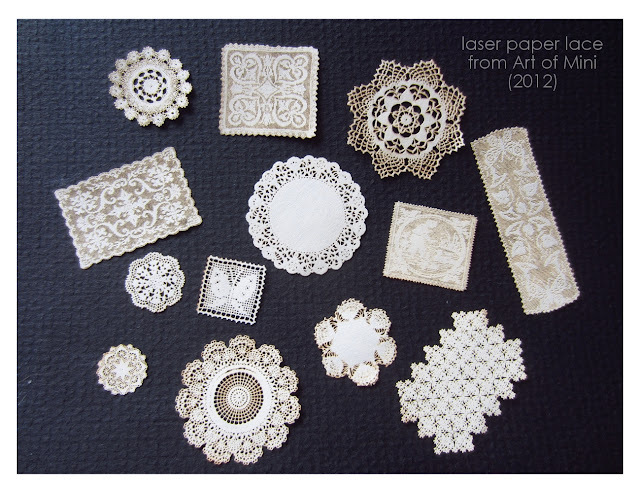 I've added the info to the post, so others can have some fabulous laser paper lace too! And Jean Day's lace is exquisite, I totally agree, but the laser paper is still very realistic and because of the different designs it's a great completion to the laser cotton lace. Good Morning Monique, What lovely gifts you received to help celebrate your birthday. Hope you had a wonderful day. Jean Day lives in Victoria and the Miniteers have had opportunities to meet her several times. Jean has such an enthusiastic and sweet character and is multi talented. Good morning Janine (it's evening here, haha), thank you! I've had very brief contact through email in which she came across as very kind and she sounds like a great lady and i'ts so nice the 3 of you (if I'm correct) have had the pleasure of meating her! It does, it is unbelievably delicate, I still can't believe it's actually so intricate and it's so thin! Thank you, I look forward to using them! I saw these today, there fab!! Hope you had a wonderful Birthday!! Thanks Jenniffer, it was very short and sober due to my circ.stances, but it was great! 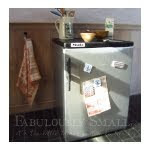 They are fab indeed, Jean has made our mini-world more interesting! Feliz cumpleaños!!! El encaje de papel tiene buen aspecto pero el de algodón es precioso. ¡Gracias Isabel! Y estoy de acuerdo con usted, el papel es muy bonito, pero el algodón es de hecho una cualidad muy especial y detallado. Thank you for sharing these wonderful sources, they will be perfect for my new project. You're so welcome Janice and I'm glad you can use this info for your new project, I'm curious to what it will become and what you'll get for it! Enjoy! They absolutely are, it's such a joy to look at them ;D The gloves are one of my favorites too! Alsnog van harte gefeliciteerd met je verjaardag! Hoop dat je een superdag hebt gehad! Ik zie wel dat je goed verwend bent in elk geval. Dit is weer een mooie post met mooie mini's. Ook complimenten voor de mooie fotoos; ndanks dat alles erg klein is, is het toch haarscherp te zien. Bedankt weer, ik smul van dit soort posts! Happy Birthday!!! :] I've used those paper laces before. You are so right -- the wealth of new inventions brings so much to the world of minis. Thank you Brae! They are great aren't they? I've used them in a few scenes too and I've always enjoyed it, I have to use the most of them still sometime, but I certainly will, it's too much fun! Impresionante el nivel de detalle que se logra con el láser!!!!! Me encanta todo!!!!! Hi Monique! Alsnog van harte gefeliciteerd met je verjaardag, hebben ze jou eens fijn verwend. Wat een geweldige kadootjes zijn die kanten spulletjes voor je miniatuur wereld. Persoonlijk vind ik de kraag, manchetten en de handschoenen prachtig, die heb ik nog nooit gezien. Ik heb jaren geleden op de DHN show van Martha Stewart een paar papieren doillies gekocht (tafelkleedjes) die vond ik, net als die van jou hier, heel mooi. Het kant echter spant voor mij de kroon: zó mooi dun en zulke prachtige fijngeweven dessins, pfiew, echt práchtig! Geniet er maar fijn van, het zal me benieuwen waar en wanneer we het zullen zien op je blog. En je hebt helemaal gelijk met je bewering dat ze hier in de 17e eeuw heel jaloers op zouden zijn geweest hahaha ;D!! Nou en of! :D Jij ook nog heel fijn weekend! How beautiful and delicate! It's unbelievable this lace is paper. Thanks for your nice comment Drora, it is unbelievable is it? And cotton (the first collectionphoto). Haha, I get that Pepper, I've looked at alle kinds of laser options to see what I might be able to have done and fabric never crossed my mind either, luckily Jean did think about it and now you can have a go at trying some of your own ideas! I'm curious to what it will be and how it will turn out! Hi Betsy, thank you! Well, I often get it from others and sharing is always nice :D. And I know what you mean, there's so much out there, it's impossible to know everything, that's why blogs are so great (and Pinterest too fo course), so we can share our findings :D. I you brave woman, that must have been very difficult.. It is astonishing indeed! This looks absolutely stunning! Thanks for sharing..
You're welcome Marion, great to read you like it! wow, these laces are gorgeous, the laser paper are my favourites, and I agree the detail on the one on the right (last image) is amazing. Lovely, lovely items and thanks for the link (I haven't seen that site before). Definitely worth taking the time to have a look at. Happy Birthday from me too. Thank you Irene! They are lovely aren't they? You're welcome, enjoy the visit!